"Schloss Elmau is everything you wouldn’t expect when you hear the words ‘resort in Bavaria,’"
Schloss Elmau (“Elmau Castle”) is a breathtaking spa and cultural resort in the Bavarian Alps. 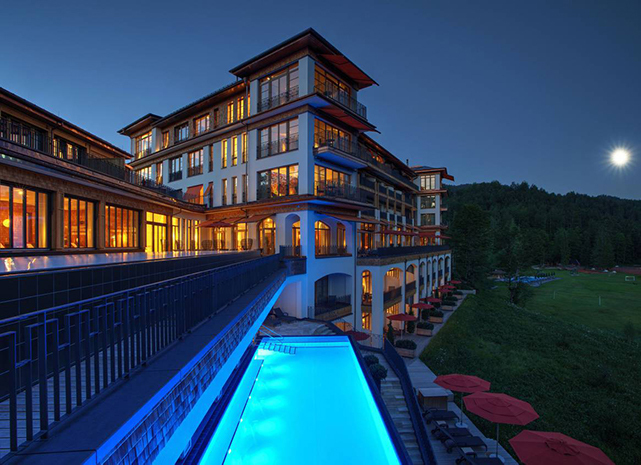 Once characterized as “an Aman resort on steroids,” Schloss Elmau is a member of Leading Hotels of the World and is arguably both the most luxurious spa resort in Germany and one of the most unusual resort hotels in the world. At Schloss Elmau visitors discover a world-class combination of Jugendstil and post-modern architecture, utter luxury, total understatement and casualness, extraordinary food, a cultural program that could shame many of the world’s most sophisticated cities — a paradise for families and couples, all set high in the Alps with a view of the Zugspitze, Germany’s highest mountain.